Displaying 121 - 147 of 147 items found. Durable, easy-to-wipe-clean oilcloth makes this apron a must-have for any task! Finished Size: Adult medium/large. Sunbonnet Sue, dressed in feedsack pastels, was a favorite in the 1930's. Dress this quick-to-make Sue in reproduction prints to brighten any room in your house. Finished doorstop size is approximately 14" tall. With a little sewing magic, you can subtly trim this tablecloth and topper with the perfect mate - itself! It's sure to please. Tablecloth is adjustable, topper is 45" square. Add storage as well as style to your home office with this 13 x 15-inch task chair back cover. The handy pocket holds everything from papers to standard-size file folders. 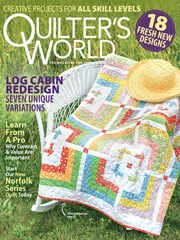 Sew a new style for your next club meeting afternoon get together with these dressy covers. This set is also a perfect fit for a card table and folding chairs. Somehow Alice in Wonderland comes to mind at the sight of these tea-party-perfect hot pads. Finished pot holder size is 8" x 8 1/2". Surprise your teenage daughter with this simple-to-sew wall hanging and watch her organize her messy room. Finished Size: 18 x 24 inches excluding hanger. Create an earthy dimension for your window treatment by serging synthetic raffia on plain sheers. This 11" x 27" fabric scroll combines applique and decorative stitching to create fans that echo the fabric design. Finished size - Fits boutique size tissue box. Made using decorator fabrics. Sewing technique - Straight stitch sewing. Pretty spring tulips provided the inspiration for this lovely machine-quilted wall hanging. Use easy machine-applique and piecing techniques to stitch this quilt and display it just in time for warmer days. Combine embroidery and serging to create these colorful streamers to hang on your patio or porch or in a child's room. This collection--colorful big bold veggies with eye-catching appeal and crisp black-and-white checkerboard trim--will add some zing to the kitchen! Finished table runner size is 38" x 17". Place mat size is 20" x 17", and pot holder size is 8 1/2" x 10 1/2". Sweet little bunnies in soft spring colors grace this wall hanging. It's the perfect focal point for an Easter party or a wonderful quilt for a baby's room. Finished wall hanging is 19 1/2" square. Add a touch of vintage charm to any room with these pillows. The Envelope Pillow size is approximately 10" x 12 1/2", and the Flower Applique Pillow is approximately 8 1/2" x 14". Welcome guests with a touch of romantic nostalgia with pillow slipcases using feedsack print reproductions and vintage kerchiefs. Colorful watermelons accent this easy-to-sew appliqued place mat set. Finished Size: Place mat: 18" x 12". Napkin: 12" square. Use brightly colored woven strips of coordinating fabrics to stitch a summery base for a display of candles or flowers. This e-pattern was originally published in Simple Serger Sewing. Finished candle mat size is 16" x 16".